Is there something better than homemade vegan gluten free crepes? 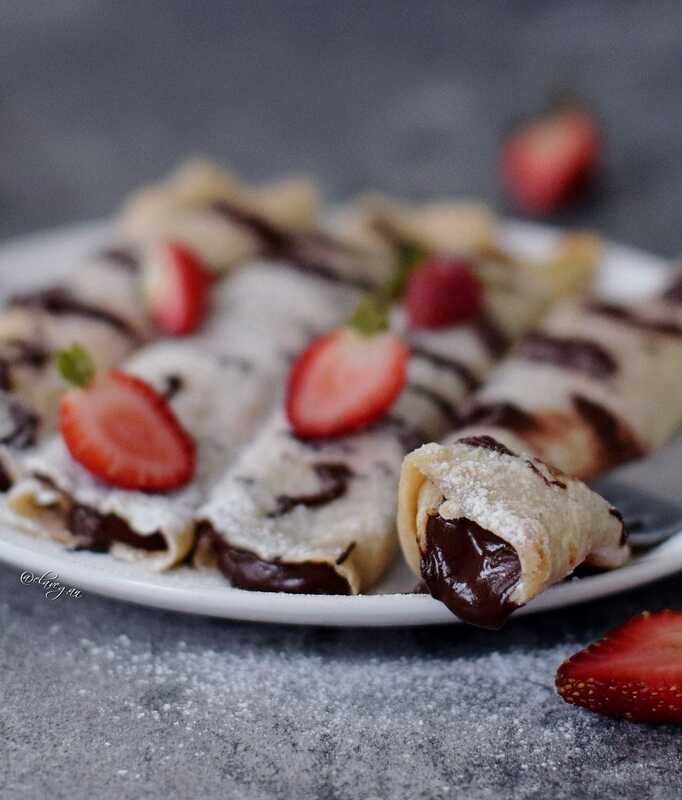 YES, crepes filled with a delicious homemade chocolate spread! I remember when I was in Paris the very first time, I was 13 or 14 years old. To be totally honest with you, I don’t remember so much from this short school trip except the Eiffel tower and crepes! I am not kidding, I love crepes so much and I would never forget their taste. Well, I still remember that I ordered a crepe filled with Nutella (yes I wasn’t vegan at that time). The crepe was super thin and the Nutella was just the perfect filling. Now more than 20 years later I still remember how delicious this crepe was. Of course, it wasn’t healthy, as original French crepes contain AP flour, eggs, milk, butter, and sugar. These are 5 ingredients to which I gladly say: “NO THANKS”. 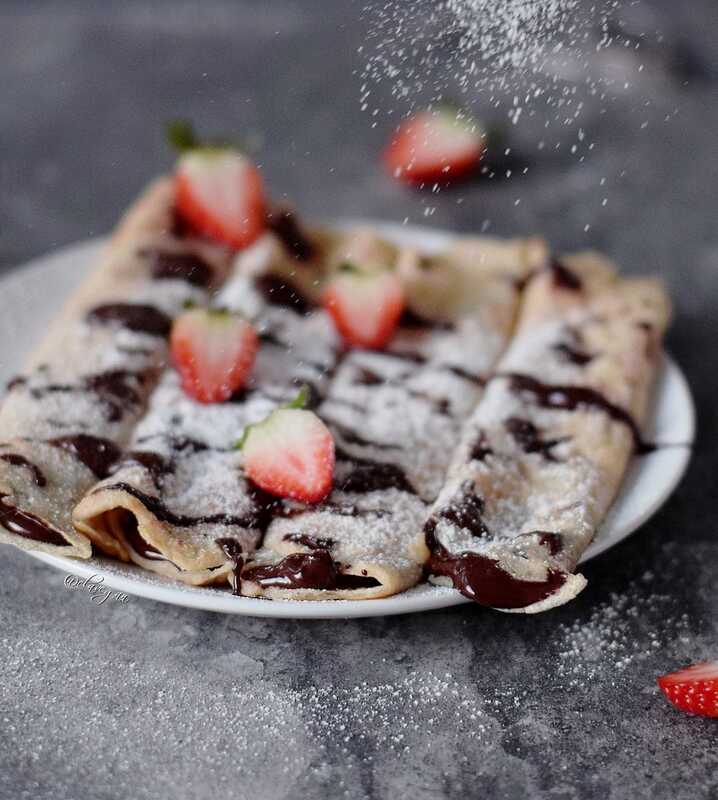 My healthy homemade crepes taste like the original French crepes but they neither contain animal-based ingredients, nor gluten rich flour and refined sugar. I made these vegan gluten free crepes already 5 times and I can’t stop eating them. Now fill these babies with a homemade vegan chocolate spread and your taste buds will thank you. 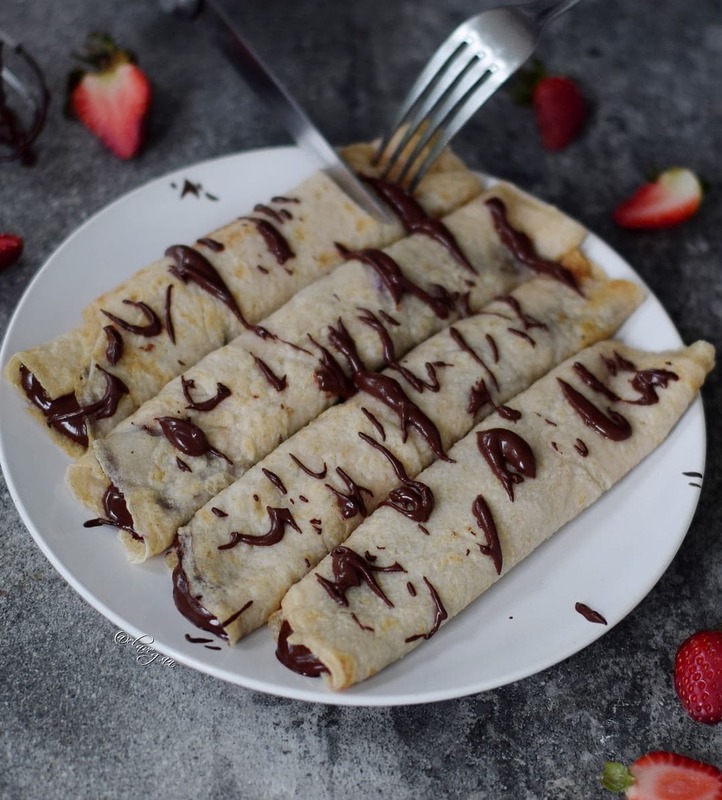 Vegan gluten free crepes which will make your mouth water! I love these vegan gluten-free crepes way more than pancakes, period. I know my American friends will probably hate me now but I would always first say YES to crepes before I say YES to pancakes. Don’t get me wrong, pancakes are amazing, they really are, and I often say YES to them. 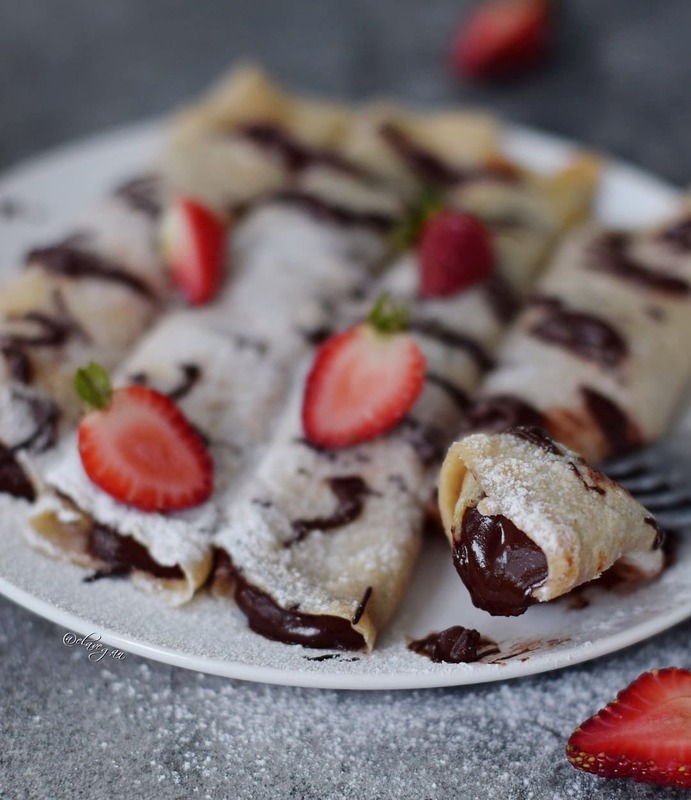 However crepes are different as they are thin, you can roll them up and fill them with this delicious chocolate cream which makes them even more delicious. Did your mouth start to water already? If not, hang on, as you can make them even better. Let’s sprinkle these vegan gluten free crepes with some powdered sugar. You just need to put 2 tsp of sugar into your food processor or coffee grinder, process it, and ready is your powdered sugar. I use low-calorie Erythritol instead of regular sugar but that’s up to you. You can read more about Erythritol in this post. My delicious homemade chocolate spread is made from peanut flour, cocoa powder, maple syrup, and water. You can find the exact recipe here (just scroll down to the recipe). This chocolate spread is low in fat and sugar but tastes just as good as a regular chocolate spread. I love to put it on toast, on my brownies or fill my vegan gluten free crepes with it. If you crave something sweet for breakfast then make my vegan gluten free crepes next time. I often make them as an afternoon snack because that’s the time when I always crave something sweet. 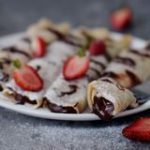 Please let me know if you give my recipe a try, I am sure you will love my vegan gluten free crepes as much as I do. 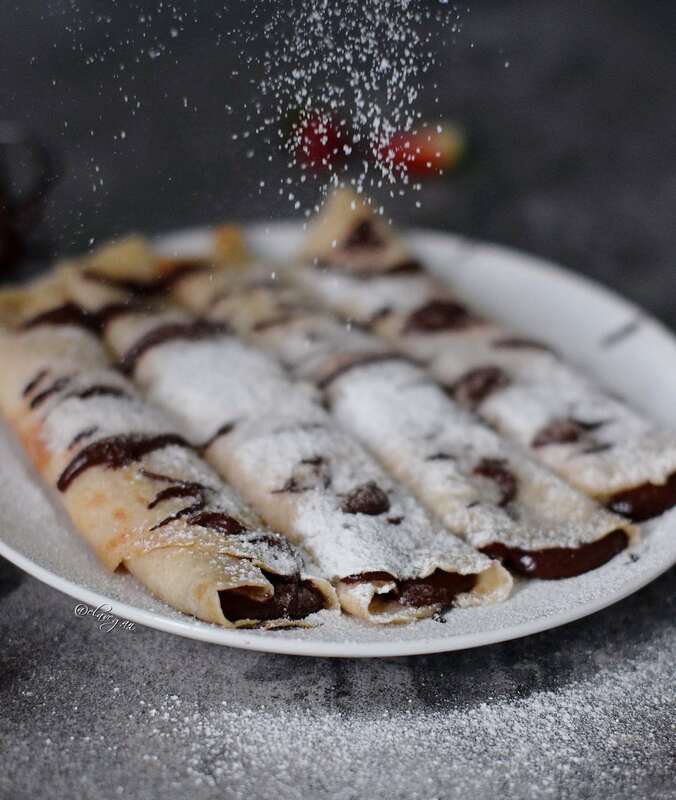 Fill your crepes with a chocolate spread, you can find the recipe: HERE (click). Enjoy! It's important to not sub tapioca flour/starch in this recipe, as it makes the crepe more elastic/flexible. These look Amazing Ela! And the choco spread: can’t believe how creamy it is and with no added fat! Thank you so much for your kind comment, Maja. ???? You are right, I still can’t believe how creamy and yummy the chocolate spread is and so easy to make too. These crepes look so scrumptious, Ela! 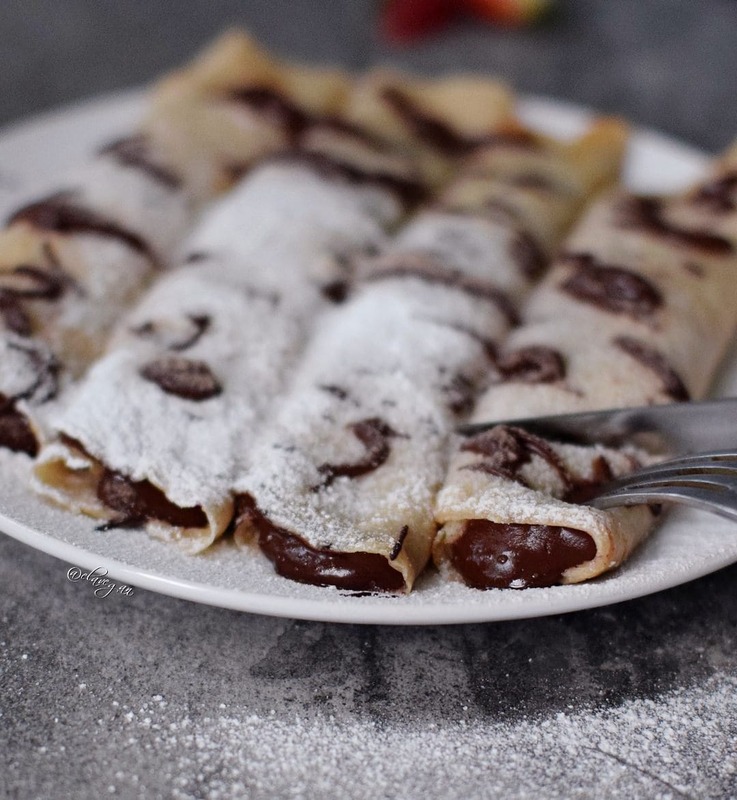 Haven’t had crepes since I visited France and would love to make these to relive my time there! What can I substitute for the potato or corn starch? I made this crepes for breakfast today and all I have to say is that they are the best crepes ever!!! I made my own oat flour and used vanilla soy milk because that’s my favorite plant milk. Easy to make and delicious!!! I didn’t even took a picture because couldn’t wait to eat it!! Will make them again tomorrow! Which pan do you use exactly :-)? I love these crepes they look so perfect. This is also on my list of recipes to try!!! I tried the recipe last night. After a little ajustement with the “milk” (had to add almond milk cause didn’t have enought coconut one) then I managed to cook the crepes easily. Very nice color and texture, great smell in the kitchen and very, very tasty crepes! For those who haven’t tried them yet, rush into your kitchen and have a trial! .I kept some batter for today’ s breakfast : yum, yum, yum! Ela, thanks a lot for this recipe; this is one that I will be keeping and sharing ! Wow this recipe looks amazing! I am going to ale it for sure tonight!!! I just made these today and I loveeee them! They taste exactly like the real deal but I loved knowing they were actually good for me ???? totally making these on repeat now! Thank you for the amazing recipe ???????? Thank you so much for sharing the recipe!!! Vegan crepes… whaaaaat!!!? Love it! ??? ?Can’t wait to make them tomorrow, sounds like I have all the required ingredients ???????????? It is ok not to add potato starch or corn strach ?? Ot maybe i can use something else? I just made this recipe and it was DELICIOUS!! I used regular flour instead of oat flour and it still tasted great! I was wondering if the oat flour is special in this recipe or if using any other flour is fine?? What can I use instead of flax seeds? These look amazing!! Is there a sub for the oat flour that works? I’m celiac and oats bother me as much as gluten. hello ela! is it ok to exclude the corn starch if i don’t have it? how does it help the recipe? 🙂 thanks for posting such amazing food recipes that are gluten free! kudos to you! can these me used for savory as well? Are they fluffy crepes or more on the thin brittle side? Thanks! I”m not vegan but want to make this recipe. How many eggs do I use? Since I am vegan, I cannot answer this question as I won’t make the recipe with eggs. You could try using one and see if that works. I just made this recipe, turned out great! Thanks for sharing.